Portuguese studio CVDB Arquitectos has created a tapestry museum with vaulted ceilings, marble walls and funnel-shaped skylights inside a twelfth-century hospital building (photos by Fernando Guerra + slideshow). The Tapestry Museum is located on the edge of a plaza in the small Portuguese town of Arraiolos, which is famed for the embroidered wool rugs and carpets that have been in production there since the Middle Ages. CVDB Arquitectos planned the interior of the two-storey building so that galleries on both floors surround a double-height atrium with an arched ceiling. Square windows offer views through into the galleries on the two long sides, while a single first-floor balcony at the far end offers a vantage point where visitors can survey the space. A local marble combining shades of grey and white covers the atrium floor and continues through the rest of the ground-level spaces, occasionally wrapping up onto the walls. "It's a very local material," architect Joana Barrelas told Dezeen. "Because we were refurbishing an existing building that is itself very noble, we wanted to use a material that has the same character." Vaulted ceilings added during the eighteenth century were retained and repaired in the galleries and multi-purpose spaces of this floor. Each have been painted white and feature decorative mouldings. Marble staircase treads lead up from the atrium to the larger exhibition rooms on the top floor, where the floor surface switches to tauari wood that has been left unpainted to display natural yellow and pinkish hues. "It's a different noise as you walk over the first floor, rather than the ground floor," added studio co-founder Diogo Burnay. The roof and first-floor ceilings were completely restructured to create a series of funnel-shaped skylights, allowing light to filter evenly through each of the galleries. Only one room maintains the old roof construction, which comprises a row of wooden trusses topped by a long narrow skylight. Glazed doors reveal a first-floor terrace with a marble bench. From here, guests can look out over the town or down to a small courtyard just below. The historic exterior of the building was restored and repainted, while a new staircase was added at the rear to allow tapestries to be easily transported in and out of the building. The Tapestry Museum in Arraiolos occupies an existent building that once was Espírito Santo Hospital. 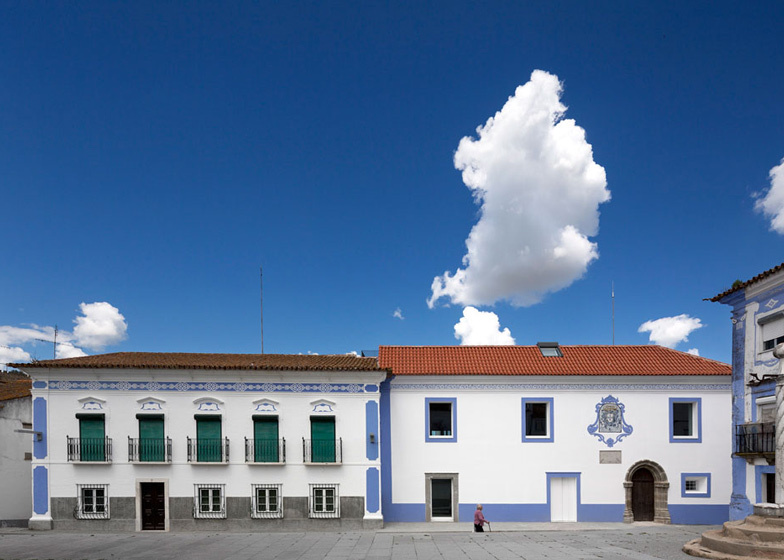 The building is located in the main square of Arraiolos (Lima de Brito Square), a small town in Alentejo, Portugal. This public space streamlines the town's social and cultural life. It gathers the Municipality and some commercial services. The Tapestry Museum contributes to consolidate the character of the square as qualified public space, in the urban tissue of Arraiolos. The existent building congregates a diversity of interventions and transformations registered along its history. Some of its features needed to be preserved and integrated in the rehabilitation process. The project is based on the adaptation of a contemporary architectural language to the existent building, in order to guarantee a consistent exhibition path explaining the process of making Arraiolos' Tapestries and their history. The rehabilitation process was developed in compliance with functional programme requirements and technology demands. The programme is organised according to a central axis which contains the access and distribution areas. The central distribution space establishes the connection between the three main public areas of the building (temporary exhibition/multipurpose room on the ground floor; exhibition area on the first floor and education services on the ground floor). This space is considered the core of the Tapestry Museum. The architectonic features of the space rely on its double-height and vaulted ceiling. The existence of window-like openings and passages allows a diversity of visual connections through the core to the surrounding areas. In the ground floor of the building, the vaulted ceilings were preserved. In the multipurpose room the structural system was remade with metallic beams, according to a contemporary architectonic language. The intervention in the first-floor ceilings was more comprehensive. All the roof area was replaced by a set of ceilings shaped as "inverted funnels" with a skylight on the top. The structure of the roof was maintained only in one room, characterised by a sequence of wood trusses topped by a long skylight. There's a new light over the old Espírito Santo Hospital, coming from the new Tapestry Museum, a building that enhances the cultural life of Arraiolos. Design team: Joana Barrelas, Rodolfo Reis, Ariadna Nieto, Ângelo Branquinho, Hugo Nascimento, Inês Carrapiço, José Maria Lavena, Laura Palma e Miguel Travesso.